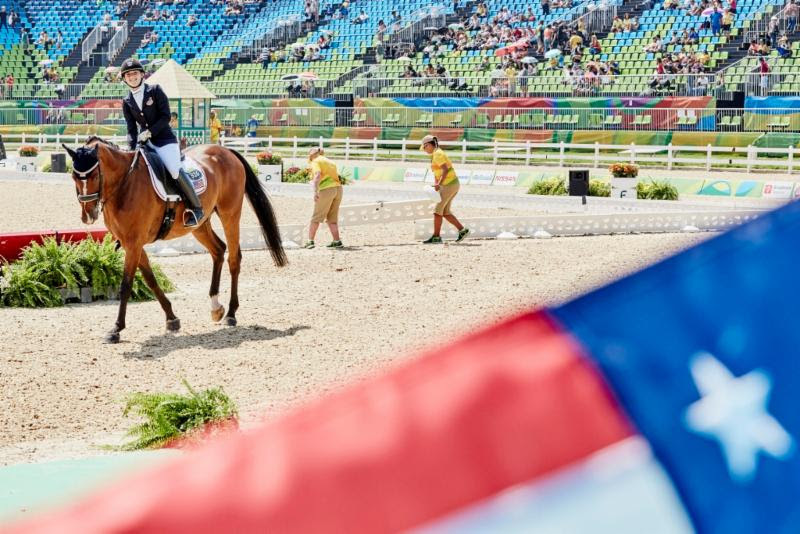 Rio de Janeiro, Brazil – Para-equestrian dressage competition got underway Sunday at the 2016 Rio Paralympic Games. Twenty-seven Grade III and Ib competitors representing 24 countries took to the main arena at the Deodoro Equestrian Center to perform the Team test, the first of two tests in team competition. Angela Peavy (Grade III) and Sydney Collier (Grade Ib) got the U.S. team off to a solid start, putting the U.S. provisionally into third place among the 14 nations, following day one of team competition. Five nations turned in one of their four Team test scores, while another three will not see their first athletes until tomorrow. Leading the team standings currently is France, while Denmark sits in second place. Both countries posted three of their four Team test scores. The Grade III Team test commenced the competition in the morning session with 16 athletes representing 13 nations. Pathfinding for the U.S. was first-time Paralympian Peavy (Avon, Conn. and Wellington, Fla.) riding Heather Blitz and Rebecca Reno’s Lancelot Warrior, a 2002 Hanoverian gelding. The pair produced a notably consistent and accurate test that featured a fluid and precise canter tour to earn a score of 68.974%, placing them sixth in the class. The afternoon session saw 11 athletes from 11 nations in the Grade Ib Team test. Representing the U.S. was the youngest athlete in the field, Collier (Ann Arbor, Mich.), competing in her first Paralympics with Wesley Dunham’s 2003 Oldenburg mare Western Rose. In the impressive atmosphere and heat of the afternoon, Collier was able to deliver a clean test, scoring 66.440% and placing ninth in the class. Team tests will continue on Monday with Grades Ia and IV. Riding in Grade Ia, Margaret McIntosh will compete for the U.S. Team, while Roxanne Trunnell will represent the country as an individual. Keep up-to-date on equestrian competition at the Rio Paralympic Games on USEFNetwork.com, Facebook, Twitter, Instagram, and Snapchat. Coverage includes schedules, results, athlete bios, behind-the-scenes photos, and more. The USEF International High Performance Programs are generously supported by the USET Foundation, USOC, and USEF Sponsors and Members. Without the support of these organizations and individuals, it would not be possible to support U.S. athletes. The USEF is especially grateful to individuals who give generously of their time and money to support the equestrian teams.